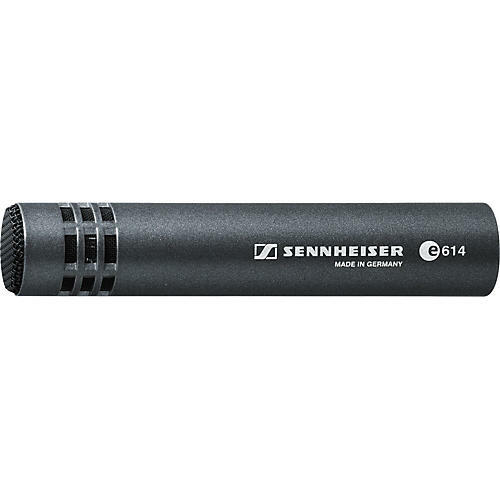 The Sennheiser e614 is a supercardioid back-electret condenser microphone. The e814 mic was designed for demanding instrument recordings that require extended frequency response, high SPL, fast transient response and compact mic size. While percussion pick-up was the first design priority, the e614 also works exceptionally well on woodwind and string instruments, and is a good choice for flute and sax where it captures the full body of the instrument. The e614 can handle high SPLs and features a medium sensitivity, which ensures reduced bleed from other instruments onstage. Because of its excellent acoustic properties this mic is also ideal for home recording. fast transient response and small size are required. Captures the "air" and the body of the instrument. Nearly flat response from 40Hz to 20kHz and a super cardioid pattern. Includes pouch and mic clip.